The following is part four of a four-part series. What Does Giving Look Like? 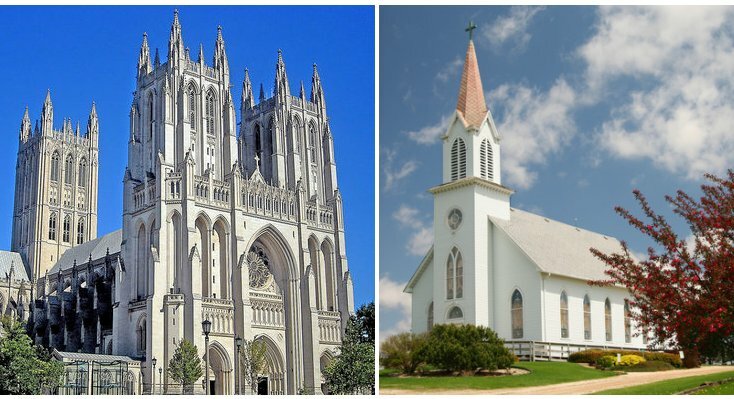 Drive down just about any street in any town or city in any state in this country and it doesn’t take long for you to drive past a church building. If you made it a point to count the number of churches you see any time you are out driving about, I daresay you would be shocked at the number. I am reminded of the apostle Paul when he first arrived in Athens, and he wept when he saw the city wholly given over to idolatry. I can imagine the scene was similar. Imagine Paul walking down the road and over here is a temple to this god and over there is a shrine to that goddess, and another temple here, and another temple there. Is it any different with churches? Can we not also say the same thing about the proliferation of churches in our cities? Are our cities too not given over wholly to idolatry, the idolatry of institutionalized religion? It used to be that you could tell a Protestant church from a Roman Catholic church. Catholic churches were these grand ornate structures with arches and stained glass. While protestant churches on the other hand were more subdued. They might have a steeple with a cross on top, but they were often much smaller and more humble looking. But that is not the case today. Protestant churches today are building massive steel structures with large capacity auditoriums, high-tech sound and stage lighting, multimedia displays, coffee bars, multi-purpose rooms for banquets and sports activities, book stores, and more. And church ministries are no longer limited to the spiritual growth and edification of its members. You can now find churches involved in community services, free clinics, day care, even aerobics classes and yoga. Now, none of these things are necessarily wrong in and of themselves. These are noble endeavors. But any person who does an honest evaluation of what passes for church today can come to the conclusion that church is big business. There is much money to be made in doing church, especially in the area of Christian education. It is not unusual for most protestant churches to have some kind of Christian day school, which of course requires its own infrastructure, its own building program, its own budget, its own system of authority. There was a time when I bought in to all of this. I diligently put my hard-earned money in the offering plate when it was passed. I would be racked with guilt on weeks when I didn’t put in any offering because I was short on cash, and then I wondered how God was going to get me for not giving Him anything that week. I gave not just with my wallet but with my own hands and my time. How many hours did I volunteer helping with the construction of the new school building and gymnasium? How many hours had I invested in painting walls, running cable, working the sound system and stage lights for the school programs, and giving and giving and giving. It wasn’t just me but scores of others in that church who did the same, all so they could have a brand new 2 million dollar gymnasium and high school classrooms. This is one of the things that hurt the most when we finally decided to leave that church. I remember that last Sunday vividly. I was filing away my choir music after the service that Sunday, and I began to weep. I looked around and thought about the 17 years of my life I had invested in that place, and it hurt deeply and profoundly. I wasn’t aware then of all I know now – that’s been a six year journey for me – but I knew something was wrong. It tore me apart to have to leave because I felt like I was leaving part of myself behind (in a sense I was), but I knew I couldn’t stay there any longer. I believed that church was supposed to be about winning people to Christ. But that’s not for lay-people like you and me. That’s for people like pastors and missionaries; you know, people who have special training and went to school to understand theology and stuff. People are slow to answer the call to evangelism, but they sure are quick to plunk their money in the offering plate for a cause. That way they don’t have to work, they can just put their offering in and let someone else do the heavy lifting and feel good about it the whole time. Churches are spending millions and millions of dollars on infrastructure, meanwhile millions and millions of people are on their way to an eternity in hell. Churches are spending millions and millions of dollars on infrastructure, meanwhile millions and millions of people are on their way to an eternity in hell! But that’s ok; you just think about how good you feel because you went to church this Sunday and gave to the building fund. Church infrastructure is all about authority, and authority is all about control. One of the best ways a church can control people is through the offering plate. Giving in the institutional church centers around the tithe. Keep in mind, many of us are already familiar with a lot of what I’m going to say, but I’m setting up the argument. Plus this will be good for the benefit of those who have never heard any of this before. Now what is the tithe? Tithe is an Old English word that means to pay a tenth. It may actually be a transliteration of the Greek word τιθετω (tie-THEH-toh) which actually means to lay in store or to reserve. What is interesting is that the English word “tithe” is used in only two places in the New Testament. The Hebrew word translated “tithes” is the word המעשר (ma-asar) and it means “a tenth.” So the prophet Malachi is bringing a message from God to Israel or some group of people in Israel and apparently this group has not been paying tithes and offering. Implicit in this passage then is the notion that the tithe is a requirement or commandment. Now I will get to the specifics of this in a minute, but suffice it to say that Protestantism has engaged in a type of replacement theology, and they point to this proof text here as evidence that the church is supposed to continue paying tithes. That seems like it might be a reasonable assumption, and if you agreed with that assumption you would be wrong. Here is why. The question we have to ask is this: Is there any place in scripture where God gave a specific commandment to pay a tithe? And the answer is yes. The very first place we see the mention of tithe is Leviticus 27:30. So here we see indeed that God is requiring a certain percentage of what the people produce. The next usage of the word tithe appears in Numbers 18:26. The first thing I want you to see is that the Levites are responsible for collecting the tithe. But why them? Well you have to go up just a couple verses for that answer, go up to verse 23. Now what do we mean by inheritance? When Israel finally gets to the promised land, after they drive out all the Canaanites they will divide the land among the twelve tribes. And you will recall that Joseph gets a double portion. His inheritance is divided between his two sons, Ephraim and Manassah. The reason then that we don’t have 13 tribes is because Levi is special. Levi is consecrated unto God. God told them Levi doesn’t get an inheritance because He was to be their inheritance. Their inheritance is service to God through the temple. Since Levi doesn’t get any land, God provides for Levi through the tithe. So all the other tribes are required to bring a tenth of what they produce to the Levites as a means of providing for them. We also learn by reading the Pentateuch that the Levites had specific cities assigned to them. In these cities were storehouses which stored all the tithes for the Levites and then they took from the stores as they needed. I think this is where the notion of the Greek word “titheto” associated with “tenth” originated. It seems as if in the Old English they took the Hebrew word for tenth, “ma-asar,” with the understanding that it referred to gathering the offerings into the storehouses, and they associated it with the Greek word “titheto” which means to lay aside or reserve, and that’s how we come to understand tithe meaning tenth. Now, let me throw in one more little wrinkle. The Levites were to tithe as well. They were to bring what was called a heave offering to the temple. This heave offering was a tenth of all they collected from the other 12 tribes, and it went to Aaron and his direct descendants, basically anyone who was serving directly in the temple in Jerusalem. So not only did God provide for the Levites, but he provided for the priests as well. Now if you go back and look at these passages that deal with the tithe there is no mention of money or currency. The tithe concerns grains, cattle, and fruits. You see the things that the people have produced from the ground. This does not include clothes, this does not include furniture, this does not include cars or tractors or weapons or shoes or anything else that a skilled craftsman might make. So obviously there was some kind of economy for the Levites, some market they could engage in and trade for or produce for themselves. The point I’m making here is that the tithe only deals with agricultural products, and it was a means to provide for the Levites. The Levites were to in turn tithe to the priests. And that brings us back to what is happening in Malachi 3. What God is saying in Malachi 3 about tithes and offerings is directed specifically at Levi and the priests. Look at the rest of the chapter following verse 8. To understand Malachi 3:8 you need to understand the purpose of the tithe as we’ve just seen in Leviticus and Numbers, and it ought to be clear that this is a rebuke specifically towards the tribe of Levi. They had failed to tithe their own offerings to the priests, the heave offering that they were to bring to the temple which was the way God had provided for the priests. And God said you have robbed me because you have robbed the priests of what is theirs. The entire book of Malachi is a rebuke of Levi. The tithe is only one item in a laundry list of offenses throughout Malachi. Now I suppose one could make the case that this rebuke of the tithe is a rebuke to all Israel. So for argument’s sake let’s assume it is. Does that really change anything? Does that change the fact of what the tithe is specifically; it’s purpose? Does that give us any liberty to take a commandment regarding the Levites and lay it over top of the church and say this includes the church now? Are we really beginning with the assumption that pastors and elders are the theological equivalent to the tribe of Levi? And for what purpose? Is it to make sure that the pastors and elders have a living? Ok, I might give you that, but then why do we need building projects and missions budgets and expense accounts? That wasn’t what the tithe was for in the Old Testament. Remember what I talked about in part one about the rabbinical Jews pointing to a verse in Deuteronomy and claiming that was evidence for the command to build synagogues? They took that verse out of context and gave it an application for which it was not intended. Hasn’t Protestantism (and really it began with Catholicism), hasn’t the church done the same thing here with the tithe? For what? All to maintain some notion of authority that they do not have, because like Paul Dohse has said frequently here at TANC, buildings speak to authority, and what price won’t people pay for their salvation? So what you have then is a system, tithing, tied to an institution for the purpose of maintaining control and authority. Is there a better way or a right way? What should we be doing with our money? If we are meeting together in home fellowships, what about this issue of offerings? Should we even take offerings? I want to focus on one particular passage here. We’re going to look at 2 Corinthians chapters 8 and 9. Now don’t worry, I am not going to take the time to exegete the whole of these two chapters. What I want to do is establish context by providing some historical background. Chapter’s 8 and 9 teach us about giving. So by way of introduction let’s just take a look at the beginning of chapter 8 and then I’ll give some exposition. …by the way, let me throw this into the mix: Study the Book of Acts carefully and notice where the majority of persecution comes from. Do the believers experience persecution from secular sources? Do they experience it from the Roman government? I can think of one instance in Acts 19 with the guys who made the statues of Diana. But 99% of persecution comes from institutional religion. It is Jewish religious leaders who are the primary source of persecution against believers in this middle part of the 1st century. So back to our text. So apparently during his 2nd Missionary Journey Paul must talk about this persecution going on in Jerusalem because at some point the Macedonians decide they’d like to take up a collection. Think of it as a sort of “care package.” They get word to Paul that they have this relief package they want to send back to their persecuted brothers and sisters in Jerusalem. Doesn’t this sound an awful lot like what we saw happening with the early believers in Acts 2 and 4. Now what is truly remarkable about this is that the Macedonians are experiencing tremendous persecution themselves. 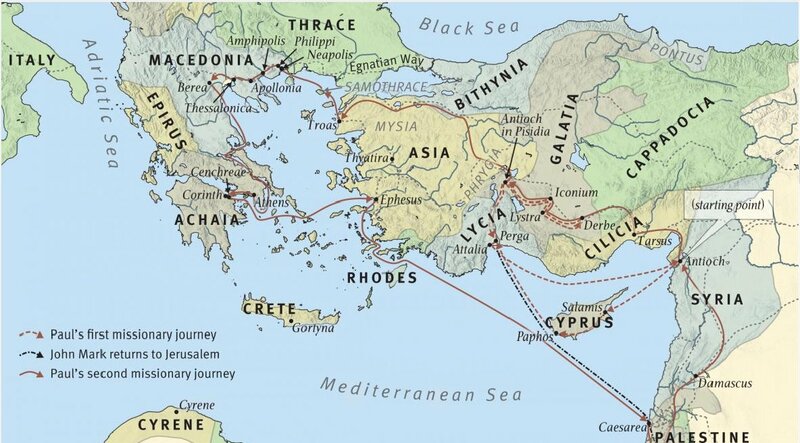 Think about the major cities in Macedonia: Philippi, Thessalonica, Berea. If you go back to Acts chapters 16 and 17, you can read all about the persecution Paul and Silas experience during that leg of their journey. They had this group of Jews following them around making trouble for them whenever they came into a new city. And the trouble didn’t stop after they left. We can read about all the trouble that there was in Thessalonica especially. And Paul even makes mention of that again in his letters to the Thessalonians. Notice that nobody prompted them to do this. Nobody compelled them. Verse 3 say they were willing of themselves. They got no tax break under charitable deductions. They weren’t led to believe it was a means of grace. They weren’t worried about being brought up on church discipline if they didn’t give their 10%. No, this was a spontaneous response to a need that they saw. And out of genuine love and concern for their brothers and sisters in Christ, they gave, and many of them gave when they themselves had little to nothing to give. And Paul commended them for this. There was an anecdote going around a few years back. I have no way of knowing if it is true or not or just one of those feel-good stories that people like to circulate. This is before the time when the Internet became as widespread as it is today. This would have been before Facebook and Myspace and Instagram. People would forward things like this around through email and share it that way. But it was this story about this woman and her young children. I believe she was a widow. And their church was taking up a special Christmas offering for the poor and needy so that they could have a Christmas meal and presents and things. So the children come to the mother and they decide they want to contribute to this collection. And they know that they don’t have a lot of money themselves, but at the same time they don’t view themselves as poor and needy. So the mom and the kids talk about how they can save money, what things can they do without so that they can have a little extra left over and give that money to this collection. And I think the mom offers to clean houses and the kids sell some toys and they go though trash looking for things they can fix up and resell. And all the time they focus on the poor needy families who will get to have a nice Christmas. So the Sunday before Christmas this family goes to church. They put the money in the offering, and they just have all this joy because they were able to give to help a needy family. And I think you know where this is going. Christmas morning comes, and there’s a knock at the door, and they open the door and there is the pastor and his wife and a few other people from church, and they have a beautiful Christmas dinner for them and presents for the kids. And so the irony is that they got back what they gave. It’s a nice story. Like I said I don’t know if it’s true. It probably isn’t. But I tell you this because I can speculate something similar happening in Macedonia. These people, out of love for the believers in Jerusalem figure out a way to give something to this collection going to Jerusalem, even when they have very little themselves. And apparently word of this collection gets around. Word gets to the believers in Corinth, and they decide that they want to add to this collection. They let Paul know, and Paul says, ok I’ll be back in about a year. Have your collection ready when I come back. In fact I believe Paul alludes to this at the end of his 1st letter to the Corinthians. Look at 1 Corinthians 16, he gives them specific instructions about how to take up this collection. Notice the expression “lay by him in store”. Paul is telling the Corinthians that whatever they decide they want to contribute to this collection for Jerusalem, set it aside, and then when they all get together on the first day of the week, bring together what they set aside. They were to do this each week so that it is already collected and they are not scrambling around at the last minute trying to get all this organized. Paul uses this Greek word “titheto” that I told you about earlier. I want to point out that this is not a command to give a tenth. This is not the word “apodekatoo” that means “to pay a tenth”. Here we see “titheto” used in its correct context to mean to lay something aside in store for later. Nowhere in these verses is there a command to bring a tenth of what they earned. He says you bring as God has prospered you. And the word “God” isn’t even in the manuscript. The word he uses for prospered means to succeed in business. So the idea is, you lay aside what you think you can spare of your surplus, or whatever you decide you are able to bring. We’ll see a similar sentiment in just a little bit, so file this away for just a second. Fast-forward to where Paul is on his 3rd Missionary Journey, and everywhere he goes he’s telling people about what the Corinthians want to do in regard to this collection that the Macedonians started. And that’s what we read about in chapter 9. Now Corinth was a prosperous city. It was a major trade route. So because of this constant flow of goods there was opportunity for people to make a lot of money in Corinth. Consequently, it is likely that many of the believers in Corinth were wealthy. So Paul commends them for their generosity. We don’t know the extent, but it must have been significant because Paul talks about it everywhere he goes. And their generosity inspires other people throughout the province of Achaia to give as well. So Paul says that they had a year to get this collection gathered up, and since he was going to be there soon he was going to send some of his helpers on ahead (and one of them was probably Titus, because he’s mentioned in this passage) to make sure they have everything ready. It would be really embarrassing if when Paul got there that he found that they didn’t have everything they said you were going to have, especially since he’s bragged about them everywhere he went. He doesn’t want them to end up looking bad. So this is the context. Once you have this background, then this next verse makes abundant sense. And it is a familiar one. And of course any time the pastor gives a sermon about giving he undoubtedly points to this verse and then proceeds to mangle it to pieces. This verse sums up everything there is to know about giving among the assembly of believers. I will stress once again that this was a spontaneous response of these people out of the love they had for others in their family. They were not compelled to do this. And that leads us to this next point. If your church says you need to tithe your 10%, is that giving as every man purposes in his heart or is that out of necessity? Is it a genuine demonstration of love when it is expected of you to give? How are we supposed to give without grudge when the compulsion of the church for its members to give brings about bitterness and resentment, and can I even say, fear? Any time you see the Body of Christ giving in the NT, what is it for? It is your religious duty to give to the church to help spread the gospel. It is your duty to give to the church to help build our new elementary school wing. It is you duty to give to the church so we can give our pastor a much-deserved raise in salary. It is your duty to give to the church so we can make sure the pastor has an expense account so he can take prospective members out for coffee at Starbucks. It is your duty to give to the church so we can meet our missions budget this month. It is your duty to give to the church…and you fill in the blank. Notice that in all of those example I just listed, what is blatantly missing? There is no mention of widows and orphans. There is no mention of those who are in need. There is no mention of someone who is 3 months behind on his mortgage. There is no mention of someone who can’t afford her medication. There is no mention of someone who is going hungry. Are we so deluded to think that there can’t possibly be people like that in our own church? Or is it more likely that even if there are such people, the expectation is that they are still required to give their 10%. “But pastor, they don’t have anything.” It doesn’t matter, you give any way, how, “by faith”, and God will provide. Bring it into the storehouse like in Malachi 3, and God will bless you abundantly! Because if you don’t you’re going to get a visit from Bob the elder. “But Andy,” you say, “What about the Macedonians? They were poor and they still found a way to give.” Yes, they did. But what is the difference? Was it out of a cheerful heart or out of necessity? Even in Corinth, Paul said, you give as your purpose in your heart. That means, if you are filthy rich and you don’t want to give, you don’t have to. And at the same time you don’t judge and condemn others over what you perceive they should be giving. I am echoing much of what John Immel talked about in his third session at last year’s TANC Conference. John talked at length about Immanuel Kant and this notion of sacrifice. Kant basically said that what made sacrifice moral was when you did it out of a sense of duty, and even then it was only truly out of a sense of duty when it caused you soul-crushing pain. What does church tell us? Give until it hurts. It’s a wrong application of the widow’s mite. 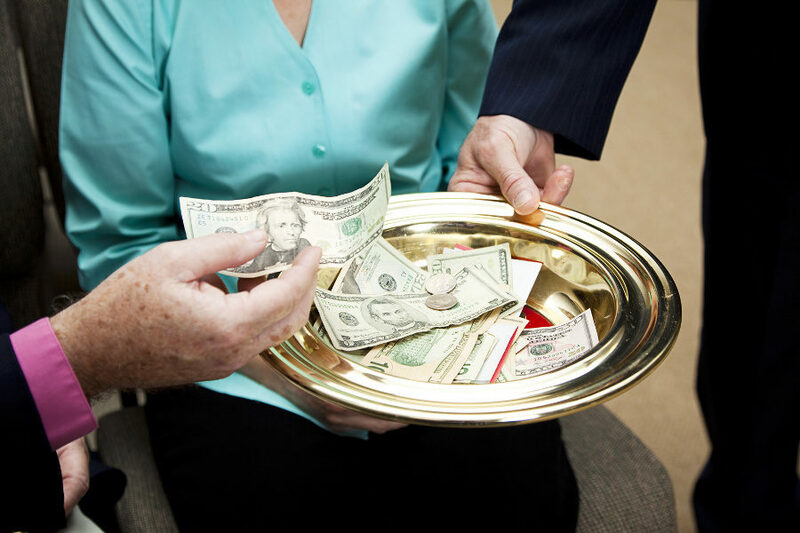 The poor schlub in your church who finds a way to put something in the offering plate each week is somehow more moral and holy than the rich business owner who tithes regularly, because he’s not experiencing any pain in doing so. That rich person needs to give until it hurts. It’s his duty. Not grudgingly. Not out of necessity. But every man as he purposes in his own heart. Think about this: In the institutional church, how much money that goes into the offering place each week gets to people who have an actual genuine need? I said at the beginning of this session that church is big business. Consider this. In 2 Peter chapter 2, Peter is talking about false teachers and he says this. Peter said that with feigned words (these guys are nothing more than pretenders) they will use you for their own benefit. They will “make merchandise” out of you. How many building programs, how many pastors’ salaries, how many books will you buy because you think these guys have the answers to life? Are you stupid? They are using you! In fact this expression “make merchandise” is actually a word that means to trade like a commodity. They will trade you like a commodity. You are nothing more than corn or soy beans or pork bellies to them. The implication is that you will be their slave. Did you hear what I said? You will be their slave. With feigned words they will pretend to be something that they are not, and they will enslave you, and they will buy and sell you like so much chattel on the open market, and the worst part is you make yourself a slave willingly! In a home fellowship assembly, what need is there of infrastructure? What need is there of paying a salary? What need is there of an expense account? What need is there of a missions budget? This is what a family does. This is what it means when we say that the Body of Christ is a family and not an institution. I am waiting for the Calvinists/Reformed bunch to list their entire evil movement on the Stock Exchange, that’s how greedy that lot is. It’s a snob club; a boys’ club, a cover-up club, a nothing-to-do-with-God club. Your last two paragraphs are what it is about, Andy. I can’t tell you how many times, back in the evil days, I had been warned about not tithing and Malachi always came up, and the “pastors” tried to put the fear of the devil in me and my then wife. They failed miserably. Do you know that some Calvinist churches’ members have signed fixed debit orders from which their holy tithe is deducted monthly? Listen, I still want to see a person who has nothing to give something. It’s senseless and impossible. Then these deceivers play the “faith” card so their Hummers can be updated to newer models. Draw your own conclusions; strip clubs have ATMs handy too…not much difference between the two if any. I couldn’t agree with you more about getting believers out from being under the law of tithes. There aren’t many subjects that get me riled, but this is one of them! All you need to do is some reasonably careful reading of the bible and a bit of background to the OT system and you should be free of this. 2 Cor is the death knell to it. I’ve seen this placed on believers as a burden to finance relatively well-off ministers or ministries. I don’t think they should be kept in poverty, but nor should they be guaranteed an income significantly above the average of the congregation. There are a few more charismatic fellowships in the UK where the ‘minister’ is either paid a very small basic salary or no salary at all, and trusts God to supply his material needs. I wouldn’t say this ought to be the norm, but is a real challenge to more worldly thinking on this score. I think the OT principle only continues in that if someone has so much ministry they cannot also do a full-time job, the church ought to support them if they give it up. Also some aspects of what tithes were used for are covered in modern day taxation. The word tithe, incidentally, come from an Anglo-Saxon word ‘teoþa’ meaning a tenth, and originally this meant a tenth of farm produce was given to support the church. Such produce was stored in tithe barns, and a couple of hundred of them still exist in the UK dating before 1550. My sister, who feels the same way I do, only recently complained to me that the pastor had given the old spiel of ‘bringing the tithes into the storehouse’, meaning the church, which would result in blessing. The would mean that blessing is granted on the basis of law-keeping, which negates the grace that believers are under. To be fair, I think my sister’s pastor was only trying to enourage regular giving rather than demanding 10% should go to the church, but this doesn’t justify the mis-use of Malachi to achieve this. The more I study history the more astounded I am at just how integrated the “church” was in the affairs of kings and kingdoms. The more I study it the more apparent it is that the church had the real power because it had all the wealth and was very influential in setting up kings and rulers not only in Britain and among the Anglo-Saxons but everywhere. You can see that same desire for power and influence today in Protestantism. I daresay were it not for Americanism that would indeed be the very state of this country! I just happened to find the actual text of the anecdote I referenced in my essay above. I leave it here for your reading pleasure. Take it for what it is, but personally I still get a little weepy as I re-read it. I’ll never forget Chrsitmas 1946. I was 14, my little sister Ocy was 12, and my older sister Darlene 16. We lived at home with our mother, and the four of us knew what it was to do without many things. My dad had died five years before, leaving Mom with seven school kids to raise and no money. By 1946 my older sisters were married and my brothers had left home. A month before Chrsitmas the pastor of our church announced that a special Christmas offering would be taken to help a poor family. He asked everyone to save and give sacrificially. When we got home, we talked about what we could do. We decide to buy 50 pounds of potatoes and live on them for a month. This would allow us to save $20 of our grocery money for the offering. When we thought that if we kept our electric lights turned out as much as possible and didn’t listen to the radio we’d save money on that month’s electric bill. Darlene got as many house and yard cleaning jobs as possible, and both of us babysat for everyone we could. For 15 cents we could buy enough cotton loops to make three potholders to sell for $1. We made $20 on potholders. That month was one of the best of our lives. Every day we counted the money to see how much we had saved. At night we’d sit in the dark and talk about what a wonderful Christmas the poor family was going to enjoy by having the money the church would give them. We had about 80 people in church, so we figured that whatever amount of money we had to give, the offering would surely be 20 times that much. After all, every Sunday the pastor had reminded everyone to save for the sacrificial offering. The week before Chrsitmas, Ocy and I walked to the grocery store and got the manager to give us three crisp $20 bills and one $10 bill for all our change. We ran all the way home to show Mom and Darlene. We had never had so much money before. That night we were so excited we could hardly sleep. We didn’t care that we wouldn’t have any presents for Christmas; we had $70 for the sacrificial offering. We could hardly wait to get to church! On Sunday morning it was cold and snowy, and the church was a mile from our home, but it did not matter how cold we got. Darlene had cardboard in her shoes to fill the holes. The cardboard came apart and her feet got wet. But we sat in church proudly. I heard some teenagers talking about the Smith girls having on their old dresses. I looked at them in their new clothes and I felt rich. When the sacrificial offering was taken, we were sitting on the second row from the front. Mom put in the $10 bill, and each of us kids put in $20. As we walked home after church we sang all the way. At lunch Mom had a surprise for us. She had bought a dozen eggs and we had deviled eggs with our fried potatoes! Late that afternoon the minister drove up in his car. Mom went to door, talked with him for a moment, and then came back with an envelope in her hand. We asked what it was, but she didn’t say a word. She opened the envelope. We asked what it was, but she didn’t say a word. She opened the envelope, and out fell a bunch of money. There were three crisp $20 bills, one $10 and seventeen $1 bills. Mom put the money back in the envelope. We didn’t talk, just sat and stared at the floor. We had gone from feeling like millionaires to feeling like poor white trash. We kids had such a happy life that we felt sorry for anyone who didn’t have our Mom and Dad for parents and a house full of brothers and sisters and other kids visiting constantly. We thought it was fun to share silverware and see whether we got the spoon or the fork that night. We had two knifes that we passed around to whoever needed them. I knew we didn’t have a lot of things that other people had, but I’d never thought we were poor. I didn’t like being poor. I looked at my dress and worn-out shoes and felt so ashamed – – I didn’t even want to go back to church. Everyone there probably already knew we were poor! I thought about school. I was in the ninth grade and at the top of my class of over 100 students. I wondered if the kids at school knew that we were poor. I decided that I could quit school since I had finished the eighth grade. That was all the law required at that time. We sat in silence for a long time. Then it got dark, and we went to bed.